We have a fantastic season lined up – tickets now on sale! Full details of performances, exhibitions, films, classes and events are available in our ‘What’s On Guide’. Get your FREE copy at Paisley Town Hall, Paisley Arts Centre or Paisley Museum. We all owe our existence to the Sun. Without it, life on Earth would be impossible. The Sun provides heat, light, nourishment for plant and animal life right down to the very atoms that make up our bodies, …which are made of the same material found inside the Sun. Safely view the Sun through the special telescopes housed in Coats Observatory. See sunspots, prominences and solar flares and learn more about our nearest star. Please note that Solar viewing is weather dependent and will not take place in the event of thick cloud or rain. You are invited to come along and see Britain’s longest running tribute to Frank Sinatra, Dean Martin and Sammy Davis Jnr; The Rat Pack is Back on Sunday 22 July with the fabulous Don Hunt Swing Band. Frank, Sammy & Dean take you on a trip to the strip in Las Vegas to the Sands hotel where they performed all the classics. The hit show perfectly captures not only the music and comedy of the original legends, but also the personalities of the stars who ruled the entertainment world from Las Vegas. Don Hunt from the Swing Band is also no stranger to the Rat Pack having played on shows featuring the real Sammy Davis Jnr. The first 3 people to email us at ram.els@renfrewshire.gov.uk with ‘VIP TICKETS PLEASE’ in the subject will win a pair VIP ‘Meet & Greet’ tickets, where lucky winners will be invited backstage to meet the band and have their photograph taken with the Las Vegas legends.! With the official launch of London 2012 upon us in just two short weeks, Renfrewshire Arts and Museums is gearing up for the fun with a themed summer workshop focusing on all things Olympic! Using animation, film, drama, music and visual arts, our award winning Community Outreach team will be on hand to help children create and prepare their very own country for entry into the Crazy Olympic Games! The week of fun-filled, creative activities will culminate in an ‘Opening Ceremony’ on Friday 3 Aug, at which children will have the chance to show off their country’s flag and team uniform to their parents, families and friends. To book call 0141 887 1010, max 25 places. Participants are asked to bring a packed lunch. Following the popular “Paisley’s Glasgow Boys” exhibition, now the girls are back in town! This exhibition celebrates a century of female artistic creativity, including new acquisitions for the permanent collection at Paisley Museum. There is an emphasis on artists associated with Glasgow School of Art, from trail-blazing Glasgow Girls, Olive Carleton Smyth and Stansmore Dean, through to their successors such as Joan Eardley and contemporary artist Mary Redmond, whose newly commissioned work is shown here for the first time. An exhibition of work by Glasgow-based artist Sharon Thomas, Herstory Portrait presents egg-tempera portraits of seven inspirational women, several of whom are the first females to gain key positions in their respective professions. Herstory Portrait includes preparatory sketches and is a unique opportunity to see inside the artist’s process. Developed over the span of the last year its primary focus is on mapping female power and influence in Glasgow today and further afield but with a compass leg positioned firmly in the experience of Thomas; a female artist making paintings in the 21st Century in Glasgow. Every 1000th, 2000th & 3000th visitor is a winner! 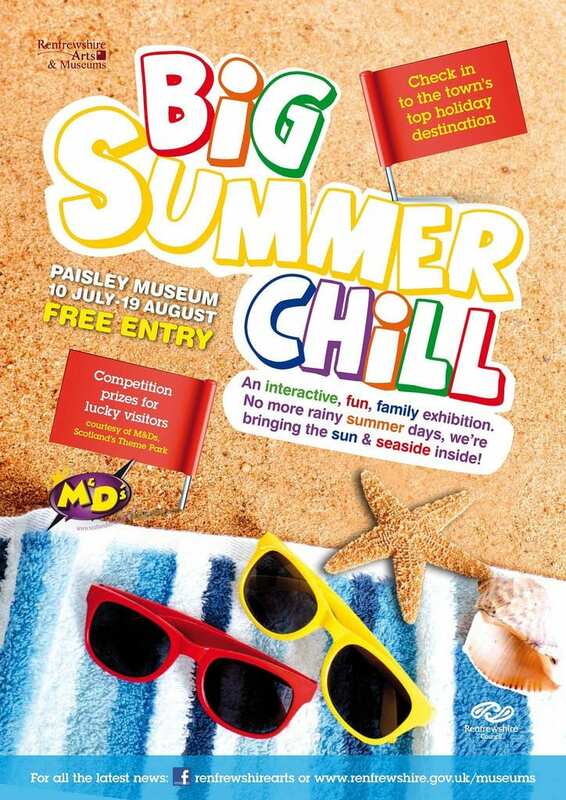 Forget expensive foreign travel and rainy British beaches…you can have your summer holiday at Paisley Museum, where we’re bringing the seaside inside. An interactive natural history exhibition for all the family, no matter what the weather is like outside. There will also be a chance to win some family passes to M&D’s Theme Park!! Every 1000th, 2000th and 3000th visitor is a winner. Check in for the town’s top holiday destination, it’s FREE! Congratulations to our lucky winner M. Tomlinson of Renfrew, who took just a few minutes to fill in a short survey after attending Renfrew Gala Day and won a £30 gift card for Braehead. We value your opinions and are always striving to provide you with the best possible service. Please take our quick survey and tell us what you think. Thank you. https://i2.wp.com/www.paisley.org.uk/wp-content/uploads/2012/07/7552274712_2b74c8c197_b.jpg?fit=724%2C1024&ssl=1 1024 724 Brian McGuire https://www.paisley.org.uk/wp-content/uploads/2015/09/paisley-logo-trans.png Brian McGuire2012-07-13 14:53:212012-07-13 14:53:21Whats on in Renfrewshire!